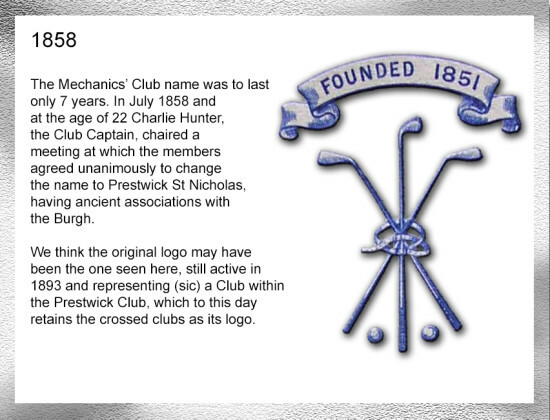 The Prestwick Mechanics Club was founded on the 3rd November 1851 with an initial membership of 28 players, and Tom Morris being the driving force behind the formation of the Club. The name Mechanics and the involvement of Tom Morris may be linked in that Tom was a member of The Mechanics Club in St Andrews. 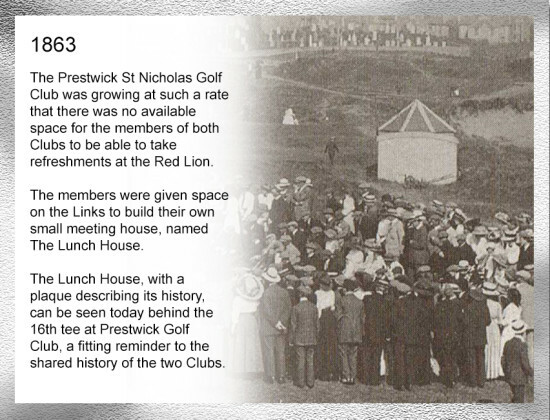 It was clear to Morris that after the formation of the Prestwick Golf Club in July of that year there was a desire by many would-be golfers to take to the links in Prestwick; he visualized the possibility of those who played the game in their spare time forming the nucleus of another Club leading to meeting of those interested in the Red Lion on the 3rd November. 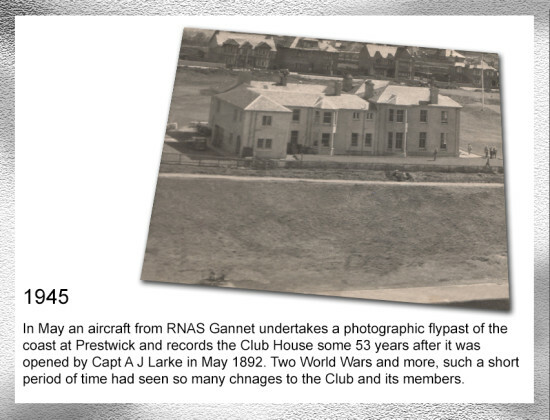 Both Clubs played the Prestwick Links, and in the first Open Championship (by which time the Mechanics had changed its name to Prestwick St Nicholas in July 1858) of 8 players our Club represented 25% of the field. 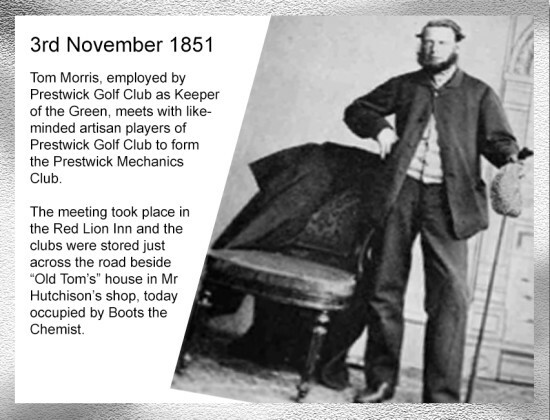 It is a proud boast of the Club that Tom Morris won three of his four Open Championships as a St Nicholas member whilst he was employed by Prestwick Golf Club. Tom was made an Honorary Member of St Nicholas in 1861 in recognition of his first victory in the Open Championship. One of the earliest pictures of our members is the famous Charlie Hunter and Tom Morris match picture taken in 1863 where they are wearing the “club colours”, made from Montgomery Tartan. Many clubs at this time adopted a similar practice and their members wore club colours when playing golf. 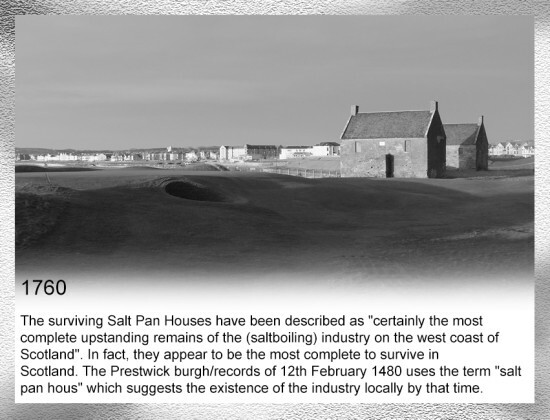 In 1863 the Club was given permission to build its own Lunch House near today’s 16th tee at Prestwick in order that the two Clubs could have their own facilities. The Lunch House can still be seen today. 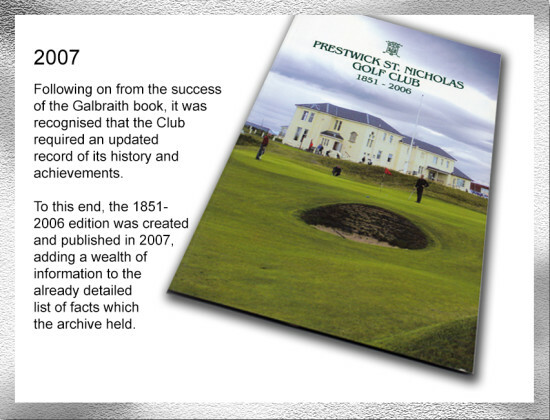 However, as memberships grew it became apparent that the two Clubs could not continue to share the same Links and after 26 years St Nicholas made the move to a new course in Prestwick, but this ground was rented on a short-term basis which was far from ideal. 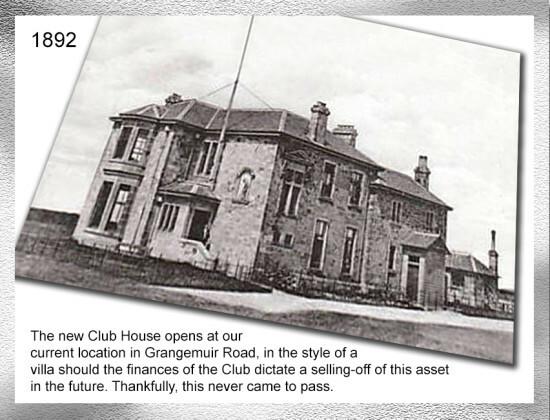 In 1892 the Club moved to the location we find ourselves in today, overlooking the Firth of Clyde and the only course on this coast where you can see the sea from every hole. 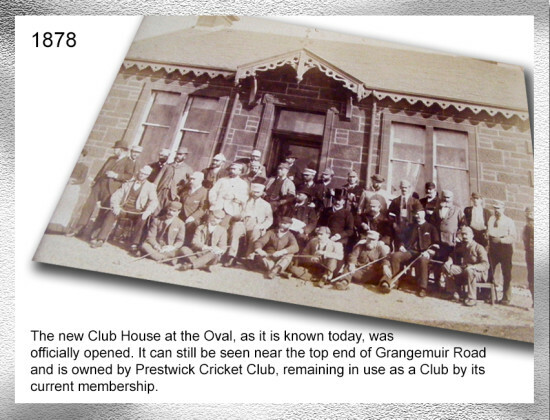 The original Club House was built in the style of a private residence on the basis that it could be sold on if the Club were unsuccessful. 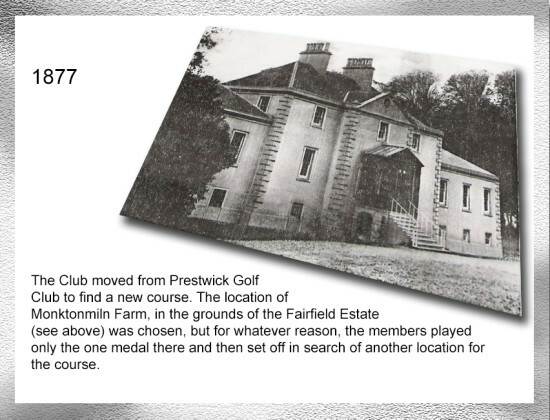 The purchase of the Club House and the Course were funded by debenture and more information can be found on this in the timeline below. 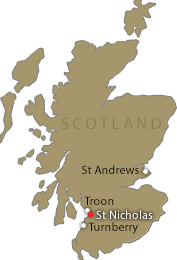 The Ladies St Nicholas Golf Club was formed in 1893 and is one of the oldest ladies’ clubs in the country. 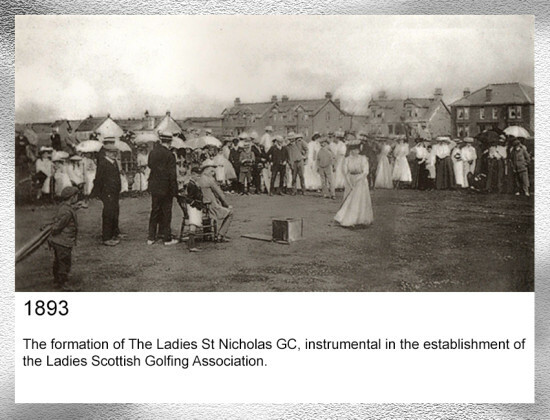 It was instrumental in 1904 in forming the Scottish Ladies Golfing Association. The formation of the Ladies’ Club resulted to some extent from the fact that the Club had to decide about the future of our previous course. 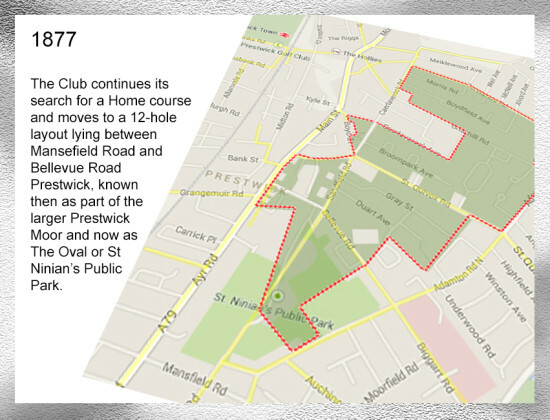 The decision was taken to open the old course to ladies and boys under 15. 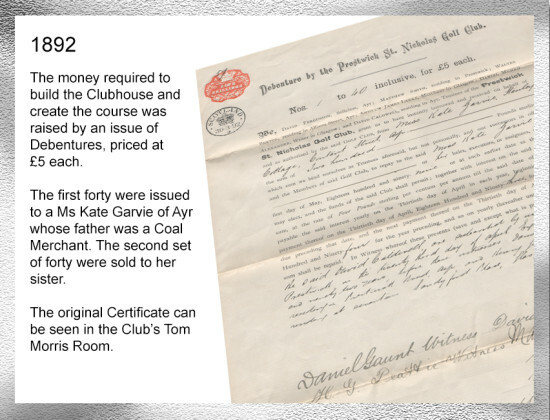 Membership of the Ladies Golf Club grew quickly and within a year was 140 – by 1906, the membership was 500. The local council owned much of the land on which the Ladies’ course was built and in 1934 they notified that the lease was to be withdrawn. 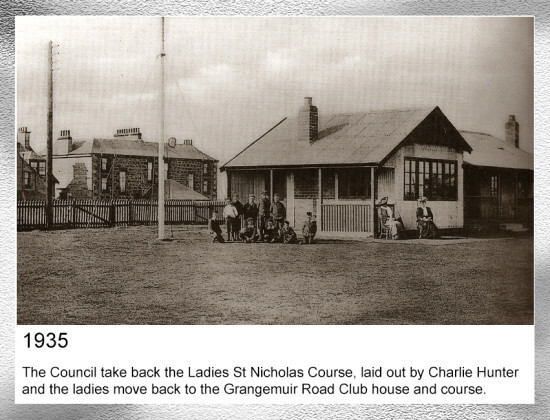 In 1935 the Ladies course closed and the Ladies’ Club has played over St Nicholas since then. 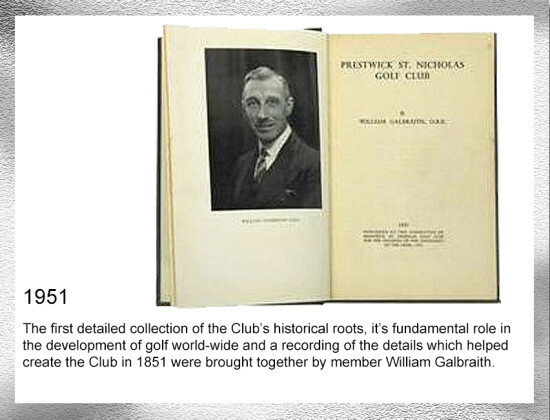 The Club today stands as a place of huge historical importance. Inside the warmly welcoming clubhouse, the golfing memorabilia, Honour and Past Captain’s boards and the clubs top competition trophies are worth a visit on their own and help to tell the story of the game and this remarkable club’s unique place in it.